Most of them like tomatoes. Tomatoes are the most powerful natural antioxidants and it helps to prevent cancer, especially cooked tomatoes helps a lot for this disease. This tomato chutney might be favorite for most of them. By the way, this tomato chutney is our family's favorite chutney. My kid loves it very much. One of my friend (Mrs. Indhu) asked me to upload this recipe for a long time, but I din't find time to upload. I specially upload this recipe for Indhu and her hubby. Wash tomatoes and boil it & red chillies with water for 5 to 10 minutes else until tomatoes skin got cracked. Allow them to get cool. Peel off tomatoes skin and filter tomatoes and red chillies from the water. Keep the drained water aside. Grind tomatoes and red chillies into paste. Add oil in a pan, once it gets hot, add mustard seeds, curry leaves and onions. Salute it until onions gets transparent. Add the ground tomato paste into the pan. Allow it to boil for few minutes or until this chutney comes thick. Once chutney gets ready, garnish it with cilantro which is optional. 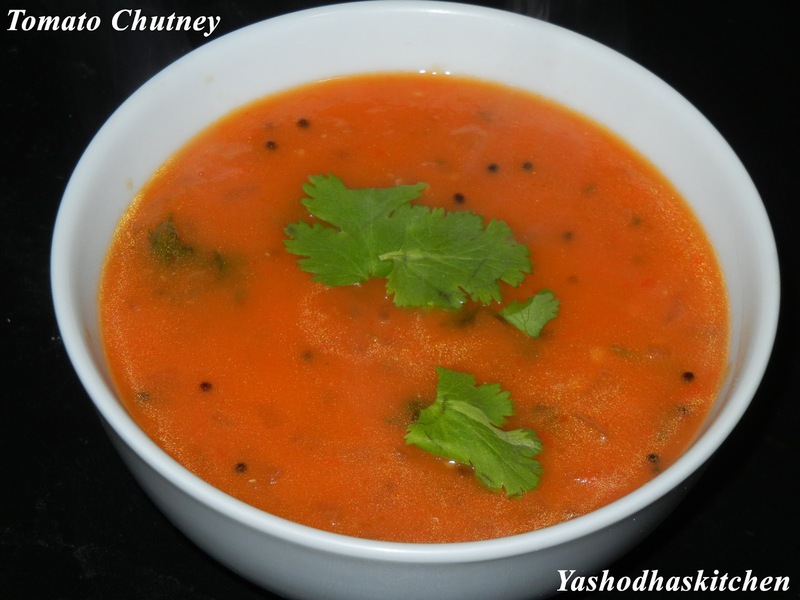 Serve this chutney with idly or dosa or even with chappathi.